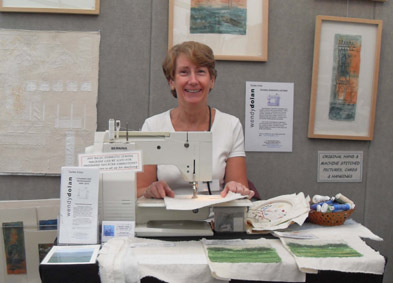 I am a Fellow of The Society of Designer Craftsmen, The Sussex Guild of Designers and Makers, The Embroiderers’ Guild and am on the Crafts Council Makers’ Index. I am qualified with a B.Ed. Degree and a Diploma in Creative Embroidery and exhibit and sell my work at Exhibitions and Shows nationwide. Specialising in Freehand Machine Embroidery and related creative stitching techniques, I offer a range of courses, lectures and workshops. I welcome commissions both large and small. Living close to the South Downs, the landscape provides a constant source of inspiration for my stitched textile designs. My current theme, ‘A Sense of Place’ records memorable journeys and locations, using fabric, stitch and texture. Architectural structures, textures, and patterns also provide a wealth of ideas which I enjoy exploring. I record my ideas with sketch, torn paper collage and my camera is always on hand. Browse my Gallery for a wide range of designs.